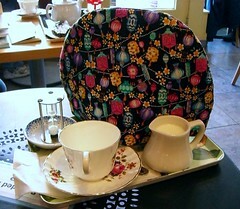 eighteenth in a royal series of Thursday posts about taking tiffin with (black) tea and milk in the NW USA. Thursday Tiffin #18: Queen Anne’s TeaCup. Excellent. On a snow-ridden Sunday afternoon I drove to Queen Annes and enjoyed a fabulous cup of tea inbetween freezing fingers of air winding thier way around my legs, ears and not-insubstantial nose. Wendy: 4 to 6 normal cups? Wendy: that’s wonderful, could I have a jug of milk too? The teapot arrived with timer to enable me to judge the brew effectively, tea-cosey to ensure the tea didn’t get cold, dish to place the removed strainer of tea-leaves in, spoon to stir in my dash of milk. Excellent attention to detail, fabulous smooth sympathetic service. I was impressed. The venue is small maybe seats 12 at most if they are all slim and breath in. The counter at the back of the shop. It’s a popular shop, people are constantly coming and going, buying loose leaf tea and accessories. On this snow-ridden January day the shop door opened every 2 or 3 minutes. Everytime a customer opened the door the fast freezing finger of January snow twisted around my thighs, yanked my ears and tweaked my not insubstantial nose. It is impossible to relax and fully enjoy your tea when the freezing fingers are regularly poking around, breaking the serene atmosphere that should surround the taking of tea. This scribble was published on Thursday, February 8th, 2007. You can follow any banter on this scribble with the RSS 2.0 feed. You can share your inspired musings after typing the anti spam word near the bottom of the page. But no Pinging because its too naughty.